Marion is a small New England town located in southeastern Massachusetts. It is one of a number of communities that are connected by water, all of which are located in Buzzards Bay. Marion is a town which captures to essence and heart of New England. The streets in the village section of Marion are lined with houses that are reminiscent of a time long since past. The New England charm of tree lined streets and white picket fences is evident throughout the village. There is still a General Store in the center of the village and the Post Office is directly across the street. Marion is also home to Tabor Academy, a well-known preparatory school. The picture perfect campus spreads out across the center of the town. Marion's harbor is listed on the charts as Sippican Harbor. It is one of the prettiest harbors in Buzzards Bay. In the summer the harbor is filled with boats of every size. 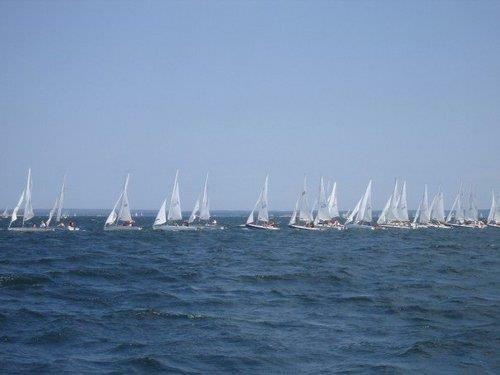 Buzzards Bay is a boater's paradise.It is known for its southwest sinds that kick up a blow almost every afternoon. Any fog that may appear in the morning usually burns off to a haze, or clears in the afternoon. Near by local harbors include New Bedford, Fairhaven, Cuttyhunk Island, Padanaram (South Dartmouth), Mattapoisett, Wareham, Onset, Monument Beach, Red Brook Harbor, Megansett, Quissett and Hadley Harbor. Nearby destinations include Nantucket, Martha's Vineyard, Westport, The Elizabeth Islands, Woods Hole, the Cape Cod Canal, Sandwich and Provincetown.